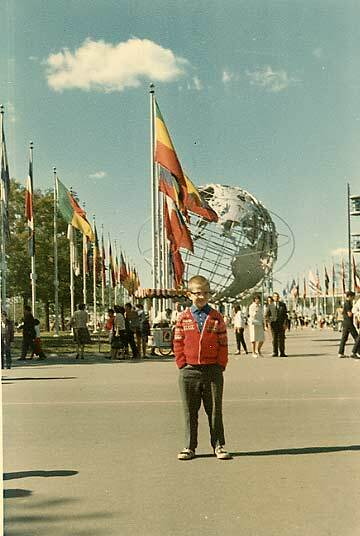 When Donald Fagen of Steely Dan had a hit with “I.G.Y.” (referencing the 1957-58 International Geophysical Year) in 1982, he wasn’t talking about the New York 1964-1965 World’s Fair in Flushing Meadows Corona Park in Queens, but with its elegiac references to now-forgotten or never-attained dreams of the future, he might as well have been. The 1939-40 World’s Fair may have been more storied and better-remembered in literature for its whiz-bang predictions of a better world just as Hitler was plunging Europe into war and the Perisphere and Trylon were soon to be melted down to make bombs, but the 64-65 Fair had its whiz-bang moments as well…and your webmaster was there, making the pictures of it on this page possible. NYC has pretty much eradicated much of the 1964-65 Fair, other than its more daring, audacious structures. Yet, here and there, you’ll see traces of the temporary, yet magnificent, buildings that were supposed to be the portals to the Space Age. As in 1939, war and economic meltdown pretty much scotched the more futuristic predictions. And nothing forecast the internet. By the way, we’ll NOT be doing a comprehensive overview of the Fair. There are a couple of other sites out there that do that, and do it well, and you can find links to them at the bottom of the page. It might be surprising to know that most of the world’s countries boycotted the ’64-65 Fair. Not because of any particular animus or grudge against the United States or New York City…it was just that there had already been a previous World’s Fair in Seattle in 1962, and most countries devoted their resources to that. U.S. industry picked up the slack. Nevertheless, 36 countries were represented, among them Jordan, whose young King Hussein (left) presented this 30-foot high marble column, built by the Romans during their occupation of the Holy Land in 120 A.D. in the city of Jerash. It was originally a part of the temple of Artemis. According to the NYC Bureau of Parks, the Jordanian pavilion was a splendid “multi-peaked-and domed structure with an undulating roof, and surfaced in gold mosaic and shimmering blue glass.” It sat near the Court of the Astronauts, between the pavilions of the United Arabic Republic and Sudan at the site now marked by this Column. 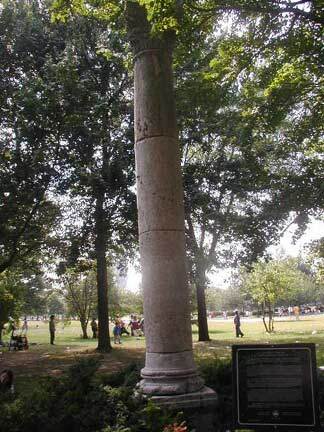 The Column is also marked by this tablet on the park path. 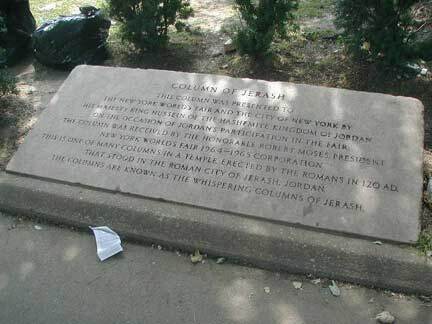 It’s likely the second-oldest man-made object in a New York City park (after the Egyptian obelisk known as “Cleopatra’s Needle” in Central Park, which is fully 3500 years old). For out of towners and Queens visitors, the Unisphere can be a surprising and impressive sight for those who aren’t familiar with it: it seems to rise above the trees and buildings like a second moon when you are in the surrounding park and nearby neighborhoods of Corona and Queensboro Hill. The 35-ton Unisphere has become Queens’ symbol in the 4 decades it has been in Flushing Meadows, and needs no introduction, being hardly Forgotten. There are some aspects to this 140’x120′ behemoth that you may not be aware of, though. 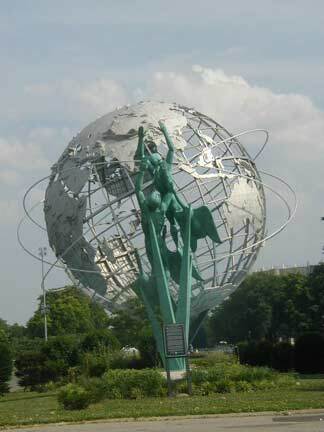 —Though Earth has no rings, unlike Jupiter, Saturn, Uranus and Neptune, the Unisphere has three. Its rings represent the orbits of the first American astronaut, the first Russian cosmonaut and the first communications satellite to orbit the Earth. 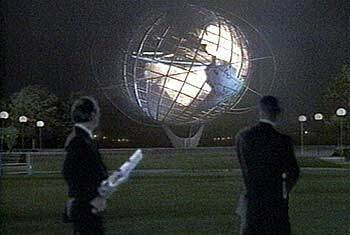 —It was quite an engineering feat to make the Unisphere stay in place, because the Pacific Ocean part of it is much lighter than the section showing Africa, Asia and Europe. 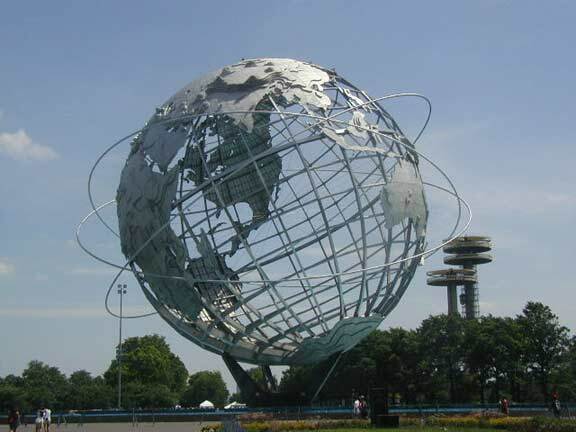 —The Unisphere tilts at the same approximate 23.5-degree angle the Earth does as it orbits the sun. The angle is believed by astronomers to be the result of the close pass or perhaps even the Velikovsky-esque collision of a Mars-size body with Earth in the solar system’s earliest days. It’s this 23.5-degree angle that allows the sun to shine on earth at different angles depending on the time of year, producing the four seasons, and perhaps, ultimately, the 4 Seasons. 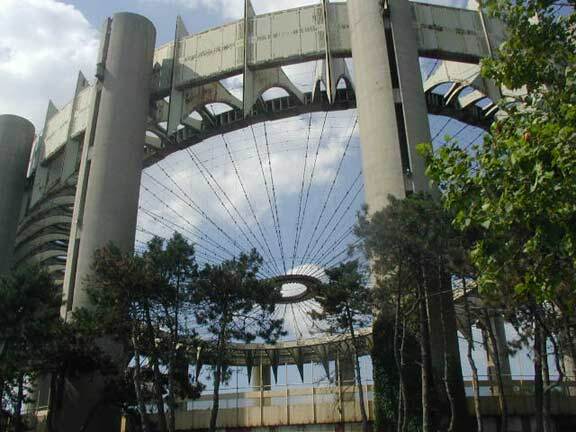 Designed by Philip Johnson, perhaps the 20th Century’s most pre-eminent architect, with apologies to Frank Lloyd Wright (some Forgotten Fans know I am a big-time Wright fan) The NY State Pavilion was among the most striking buildings in a Fair full of them. It consists of the “Tent of Tomorrow” consisting of 16 100-foot columns that supported a 50,000 sq. foot roof of multicolored panels (which was removed in the 1970s) as well as three towers, measuring 60, 150 and 226 feet tall. Fairgoers could ascend top the top of the towers via “Sky Streak” capsule elevators. Inside the pavilion, there was a scale model of the new St. Lawrence River hydroelectric plant, NY state industry information, artwork from the 19th-century Hudson River School, and portraits of NY state colonists. The NY State Pavilion contained striking visuals both above and below. Texaco funded a giant map of New York state on the pavilion floor with 567 mosaic terrazo panels weighing about 400 lbs. each. 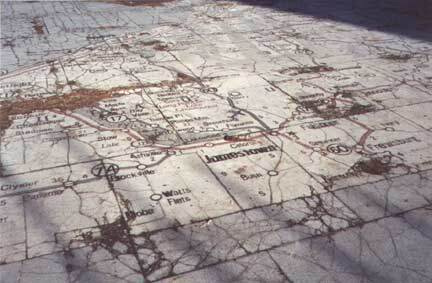 Rand McNally supplied the topographic information, and Texaco furnished the location of each of its gas stations in the state. When the pavilion’s roof was removed due to its deterioration borne of general negligence, the Texaco map was open to the elements. It’s still there, but padlocked and severely decayed. In the mid-1980s the Texaco map was still open to the public, and John Flansburgh and John Linnell of They Might Be Giants filmed a promo video for “Don’t Let’s Start” from their breakthrough ‘eponymous’ LP there. Flansburgh is known to be a comprehensive collector of all things ’64-’65 Fair. The cutout face in the video depicts editor/politician William Allen White. 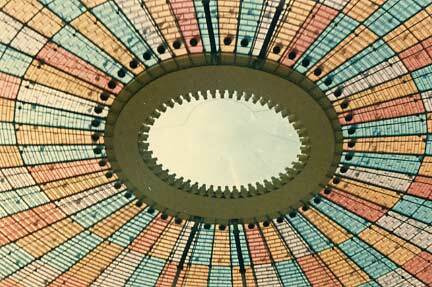 A view of the roof of the Tent of Tomorrow in 1964 showing its original panels. Orange and blue are the primary colors, and those colors were also featured on the Fair’s official literature. Coincidentally or not, the Fair’s neighbor across Roosevelt Avenue, the Amazing Mets’ home Shea Stadium, also featured large orange and blue panels on its exterior (that were removed in the late 1970s). Another remnant of the NY State Pavilion is “Theaterama” which originally exhibited pop-art works by Andy Warhol andRoy Lichtenstein. The theatre operated until 1985, when it was closed for renovation, reopening in 1994 as the Queens Theatre in the Park. Surviving into the 1990s, but not quite the 2000s, was a relic not of the ’64-’65 Fair but its 1939-1940 predecessor. 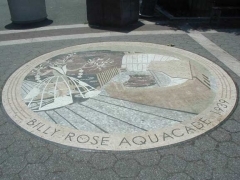 The Billy Rose Aquacade, or more properly, the NY State Gertrude Ederle Marine Amphitheatre, featured 10,000 seats looking down on a pool big enough to fit 1,750 tons of water. (When there’s that much water, gallons ain’t gonna cut it.) And what was in the pool? Synchronized swimming bathing beauties. 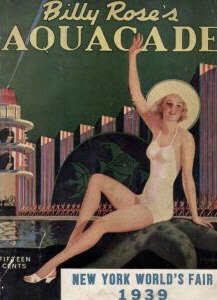 Bikinis were still over a decade in the future, but Rose, the aquatic Busby Berkeley, put on quite a show nonetheless. And there was certainly something for the ladies as well, as Rose’s “Aquadonises” included future Tarzan Johnny Weissmuller and future Flash Gordon and potbelly-masking belt salesman Buster Crabbe. The Amphitheatre soldiered on for some decades after the Fair, but succumbed to deferred maintenance and was finally pickaxed to oblivion in the mid-1990s. 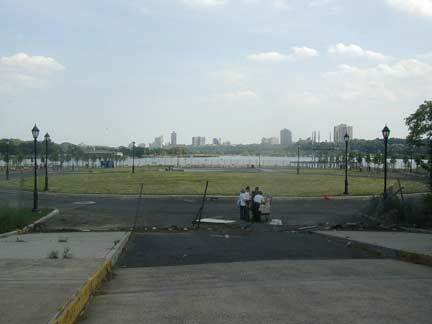 About ten years after the final disappearance of the Aquacade, a pedestrian pavilion slowly took shape along Flushing Meadows’ Meadow Lake. 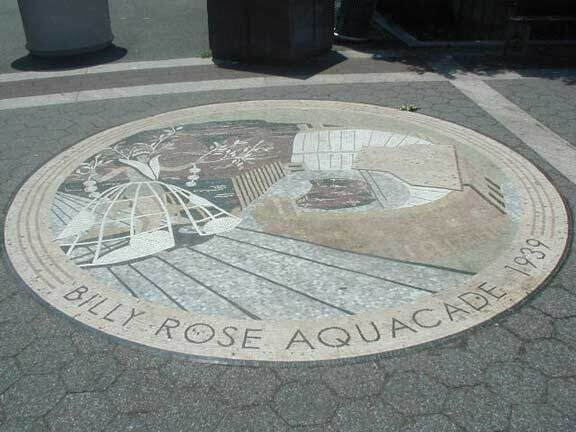 The Aquacade is remembered by a pavement mosaic at the park’s main entrance on the walkway leading to the IRT subway. Both statues are by Boston sculptor Donald De Lue. 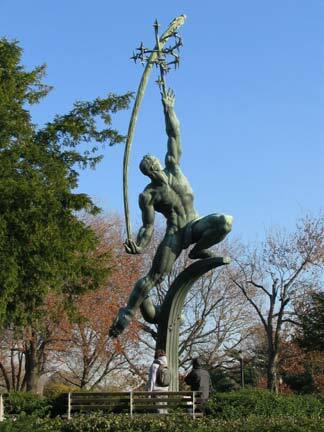 While Rocket Thrower occupies a plum location in the park, on one of the paths radiating from the Unisphere, you have to take quite a detour to reach George, who’s in a rather remote stretch of the park, off the beaten path. 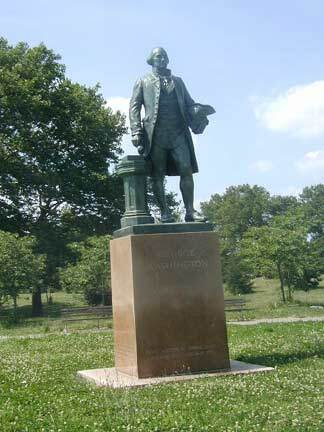 Strictly speaking, George Washington was not created for the Fair, but made its first appearance in the park in 1959. 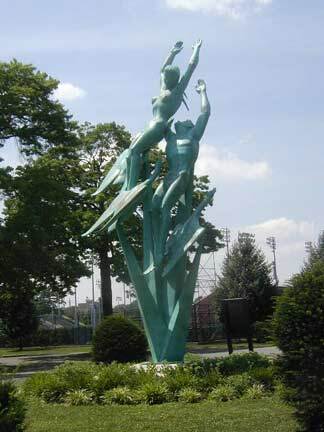 It was restored in 1999; appropriately, cherry trees now surround the sculpture. 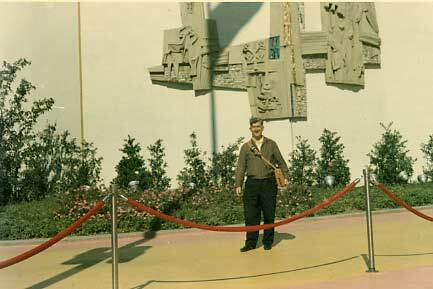 In 1964, my father stands outside the Vatican pavilion, whose main claim to fame was Michelangelo’s marble masterpiece the Pieta, in which Christ’s mother holds his prone body after His Crucifixion. 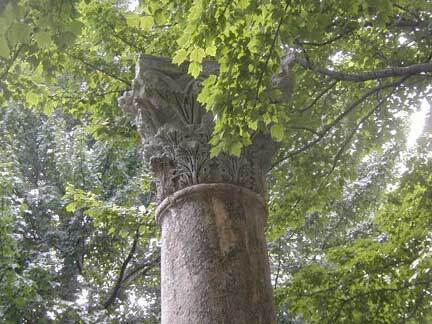 The pavilion also featered a number of other masterpieces from the medieval to the modern eras. 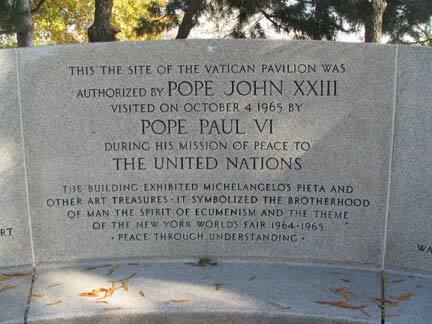 Pope Paul VI made an appearance at the pavilion in 1965. 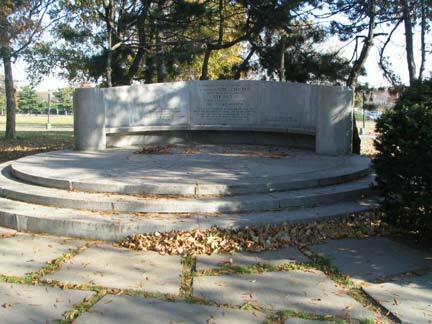 Today an inscribed marble bench, the “Exedra,” marks its spot. My father was 46 in ’64, the same age as your webmaster was when I was writing this page. It’s a big circle, this life we lead. The Mormons were not to be outdone; the Church of Latter-Day Saints had a partial reproduction of the triple-towered Salt Lake City Mormon Temple with a golden statue of the Angel Moroni at the apex of the middle tower. This was taken by my father at the Chrysler exhibit, but what was the structure on the left? My mother and I are at one of the fountains. Again, can anyone identify the exhibit in the rear? 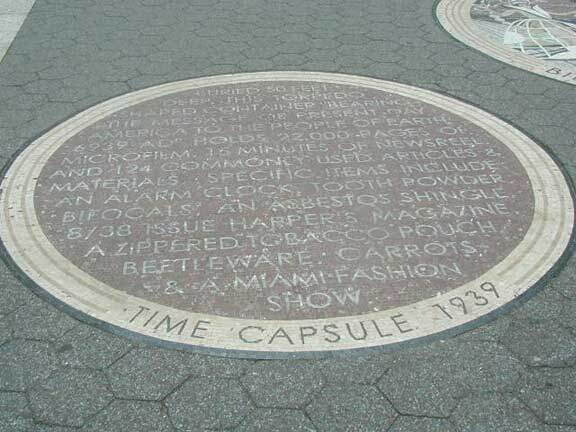 This little concrete slab, in its own little circular plaza next to the New York State Pavilion (see above), is what remains of the Westinghouse Pavilion. The electrics giant featured the 1939 time capsule, including a slide rule, a woman’s hat, synthetic rubber, 10 million words on microfilm taken from books, magazines and newspapers and messages to the future from Albert Einstein and others. Westinghouse also built a new time capsule in 1964, including filtered cigarettes, a Beatles record, irradiated seeds, freeze-dried foods and a rechargeable flashlight. The cutting edge. Don’t open till 6964! 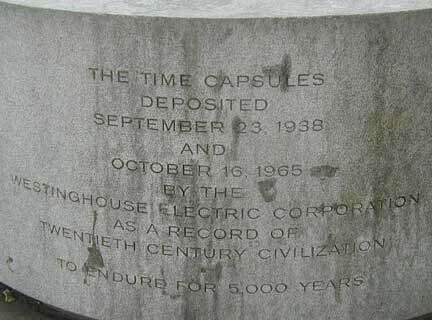 The time capsule is supposed to last 5000 years. Well, it’s lasted about 45 years so it’s off to a good start. I wish I could see what it’s going to be like in 6964. I enjoy time travel stories. I’ve seen all three Time Machine movies and H.G. Wells’ time traveler made it to April 802,701 so 6965 shouldn’t be that tough. We do know one thing: 6964 will be as different from 1964 as today is from 5000 years ago. 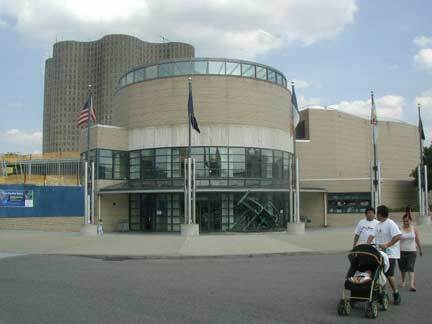 The Hall of Science is one of 4 buildings from the ’64 Fair still in active use (the others are Theaterama, now Queens Theatre in the Park, the Port Authority Heliport, now known as Terrace on the Park, and the Singer Bowl, now Louis Armstrong Stadium). Its 1964 exhibits included A Journey Into Space, How The Brain Works, The Way We Hear, Chemical Man (the body’s cellular structure), The Color Center, Atoms For Children, The Chemistry of Oceans, Flight Control, The War Against Cancer, the Diagnosis of Disease, and the Chemistry of Color. New York architecture is rather staid. Even the original, more daring plans by Daniel Libeskind to replace the World Trade Center have been considerably watered down, and we may be left with rather doctrinaire office towers. 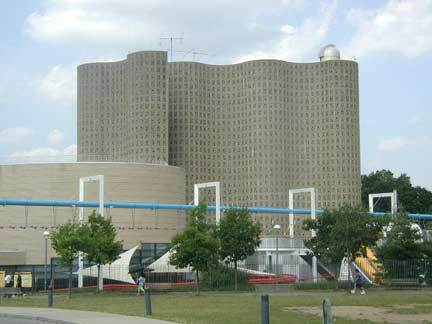 That’s why it’s notable to see an interesting item like the Hall of Science, whose rolling, undulating sheets of concrete are punctuated by squares of stained glass (it’s even more impressive from the inside). It was built by Harrison & Abramovitz and rethought and reconstructed by the Polshek Partnership in 1999. The statue originally stood in the 1964 Fair’s version of the Court of States. 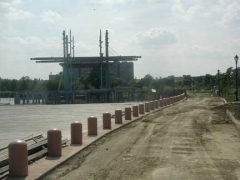 In 1996 it was renovated and resurfaced and moved to its present position in front of the main entrance to the Arthur Ashe US Tennis Center and facing the Unisphere. I never fail to bore my friends when I ask, “What two NYC stadia, across the street from each other, are anagrams of each other?” The answer: Shea and Ashe Stadiums. And now I can’t ask anymore. Few remember this, but José de Rivera’s polished crescent Free Form originally revolved on top of its base (the motor conked out in 1972 and was never re-started). De Rivera (1904-1985) created his statues with his own hands, forging and hammering his materials personally. As a result, he suffered a hearing loss. Beginning as a craftsman in Chicago, he worked as a pipefitter and die caster. 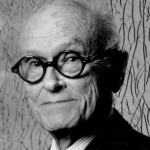 Many of his works are steel or bronze bands twisted into 3-dimensional shapes. 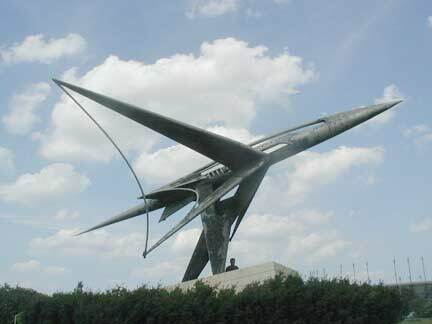 Located on a rather out-of-the-way path between the Hall of Science and the parking lot along the LIRR, Polish-born Theodore Roszak’s (1907 – 1981) Forms in Transit vaguely resembles the now-retired Concorde jet, which would not begin flying for a few years after 1964. 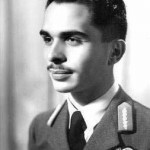 A resident of Staten Island since the 1930s, Roszak studied in France, Germany and Czechoslovakia and was employed during World War II by Brewster Aircraft on the assembly line. After works such as Spectre of Kitty Hawk (at MOMA) and Sentinel (now on 1st Ave & 27th Street) he received a commission for the NY World’s Fair and produced Forms in Transit, a 43-ft. long work made of aluminum and steel, meant to embody the spirit of flight without depicting a specific airplane. Part of the statue became corroded and was removed in 1970, but the exterior skin has been allowed to remain weathered to show the vessel passing through the atmosphere. The Vatican Pavilion was among the Fair’s most popular attractions. Michelangelo’s Pieta, the moving representation of Mary grieving over the prone body of Christ after His crucifixion, was the main exhibit. The Pieta, completed in 1499, was 465 years old in 1964, and this marked the first time it had been exhibited outside of St. Peter’s Basilica in Rome. It was brought and returned on the Italian liner Cristoforo Colombo and displayed behind bulletproof plexiglas. Pieta is the only sculpture Michelangelo ever signed. After the statue was unveiled, the great sculptor overheard some patrons attributing the work to other contemporary artists, so Michelangelo decided to mark the statue as his own, a decision he later regretted since he believed his mark disrupted the statue’s artistic purity. 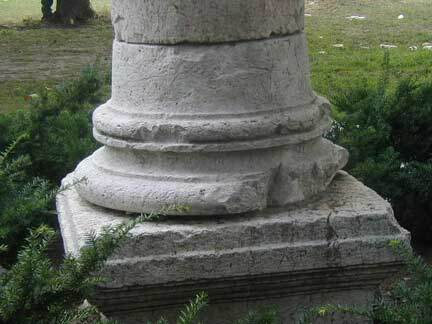 Today a marble bench, known as the Exedra, marks the location of the Pavilion. It contains an inscription invoking Pope Paul VI’s visit to the Fair in October 1965 near the end of its run. 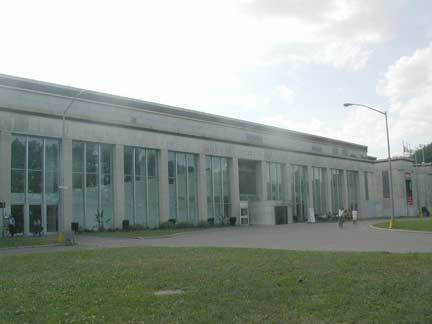 One of Flushing Meadows’ only holdovers from the 1939-1940 Fair is the Queens Museum of Art, designed by Aymar Embury in 1939 and redesigned by Raphael Vinoly in 1994; originally called the New York City Building. It contains one of the 1964 Fair’s most notable exhibits: The Panorama of New York, a scale model of the entire city showing the city’s seven bridges, highways, subways, the Empire State Building (15 inches high), more than 800,000 miniatures of every NYC building, the Queens airports with tiny planes overhead and thousands of tiny homes, and a notable subtraction, replaced by a red, white and blue ribbon. The NY City Building was the temporary home of the United Nations from its organization in 1946 to 1952 when it was moved to the newly finished U.N. complex in Manhattan. 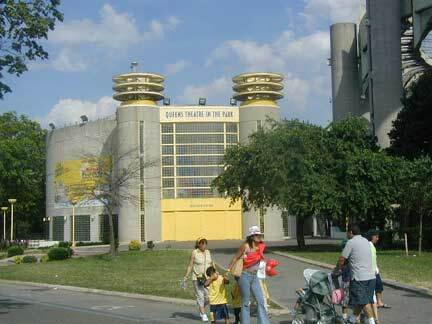 The state of Israel came into being here in Flushing Meadows in 1948. A brand new lobby area opened in the winter of 2014. Outside the pavilion, however, is another remnant from the 1939-1940 Fair, this one not nearly quite as pleasant. 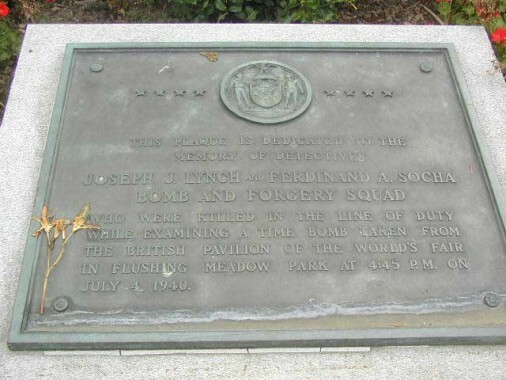 On July 4, 1940, two NYC detectives, Joseph Lynch and Ferdinand Socha, were sent to inspect a ticking suitcase at the British Pavilion. It turned out to be a bomb that exploded, killing the policemen. The planters never identified themselves; it is suspected there may have been a Nazi connection, though this may never be known. 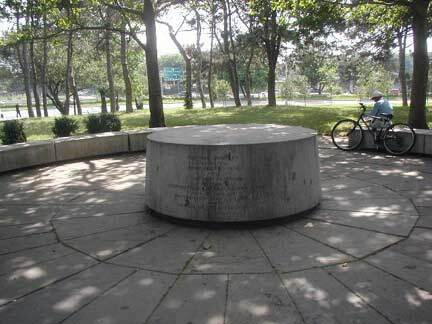 This concrete slab hidden in the grass opposite the “Free Form” statue (see below) likely is all that recalls the 1939 Fair’s Court of States, which included exhibits from 33 states plus Puerto Rico. The court featured a large dome, the Virginia exhibit (the 1939 Fair marked the 150th anniversary of Virginian George Washington’s inauguration at Federal Hall on Wall Street). 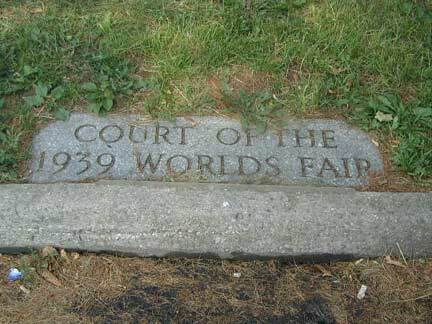 The “Court of the 1939 World’s Fair” was the second Fair’s homage to the First — in 1939 that same area was the “Court of Communications” around which there were RCA, IBM adding machines and time clocks, Crosley Radios (refrigerators and cars),and Bell Telephone with their futuristic and somewhat frightening keyboard controlled human voice synthesizer. NYWF ’64 World’s Fair site–the fabbest Fair site out there. Your web site is fantastic. Thank you. 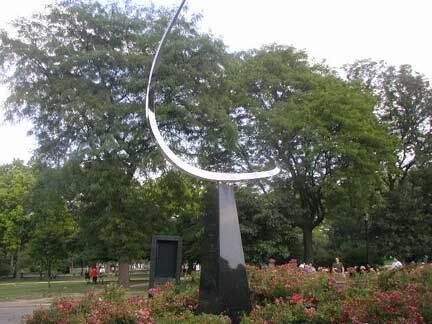 I visited the World’s Fair grounds yesterday for the second time this summer and found that José de Rivera’s Free Form is indeed rotating slowly and steadily! I don’t know how long it has been operational since 1972, but IT IS WORKIING! Thought this might be a cool update for your very informative website. I was sitting in my office today when a breeze blew through and with the help of an olfactory flashback sent me reeling back in time to 1964 (August) when my mother and brother visited the Fair. There was also a hint of the neighborhood I lived in (Point of Woods/Hauppauge) in the air. I went online to find anything about the old Fair and came across you site. Thank you for you work. 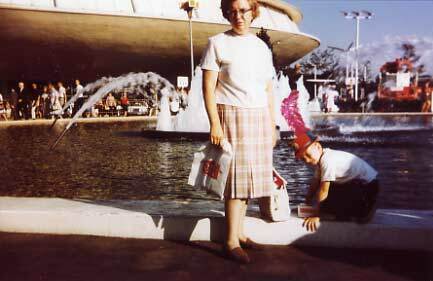 In answer to the webmaster’s question about the photo of he and his mother in fornt of one of the fountains at the 1964-65 New York World’s Fair, I believe that the building behind them is the General Electric Pavilion, which I remember resembled a giant flying saucer. 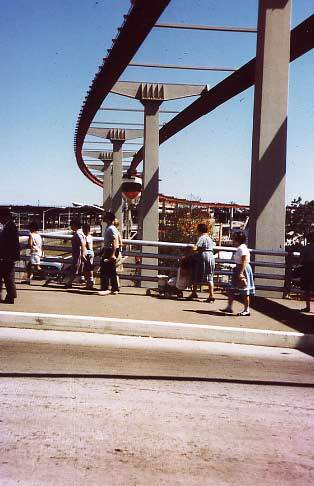 In many ways, the 1964-65 World’s Fair was far more Space Age-y than the 1962 World’s Fair in Seattle. 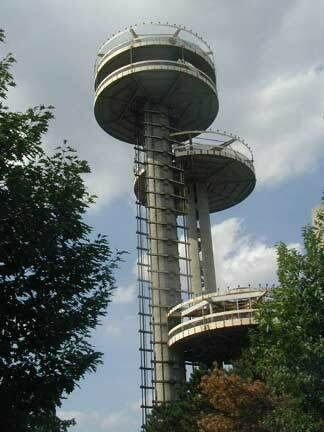 What Baby Boomer can look at the towers of the New York State Pavilion and NOT think of “The Jetsons?” I couldn’t. Even now, almost half a century later, the theme of “The Jetsons” rings in my head every time I see a photo of those towers. Believe the pavilion behind the fountain is Bell Telephone. It was a major thing, all held above the ground by cool looking supports (as I remember) with moving trains of wingchairs with speakers in the wings, like Ford, GM and the Moses model of NYC. Rafael Vinoly is a star architect still alive, I believe, but was probably not alive when the New York State Building was built. Believe he was involved with the Museum of Art transformation. Came to your site in search of the Aquacade since have been thinking about going to the Art Museum and didn’t see it on Google Earth. That’s the first place I ever went swimming. Same as to ice skating & the NYS Bldg. They used to set off fireworks from the middle of that fountain/pool by Bell Telephone every Saturday night and i was often there since my father would bring me at night and my brother in the morning to keep us from fighting. Remember Louis Armstrong played there more than once in conj. with color-lighted water in the fountain & fireworks. Bell Telephone was in the spot opposite the Unisphere, at the opposite end of all those pools/fountains. 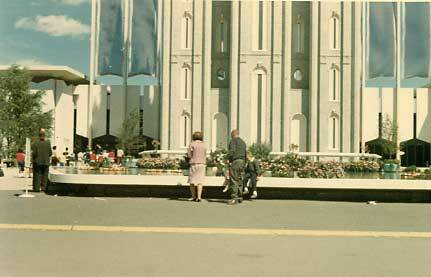 Apparently the LDS pavillion was recycled in other Church buildings after the fair. Renew, reuse, recycle. Nice page! I can definitely ID the pictures in question. For the Chrysler one, there’s part of the track for the Avis Antique Car Ride on the far lower left, one of the Fair’s colorful luminaire street lights, then the rocket and Pentastar theater at Chrysler. The photo with the fountain was at General Motors. You can see a GM locomotive off to the right of the main rotunda section of the building. The fountain was the Fountain of Progress South. Stop by my site http://www.worldsfairphotos.com/nywf64 for quite a few photos and files on the Fair. Absolutely love this page, and this entire site. I’m intrigued (!) by the mystery of which building you and your mother are standing in front of, which looks like a flying saucer. As Skeeter says above, it might be the GE Pavilion, but in looking at many pictures of that pavilion, I don’t something that looks like the exact section you guys are standing near. The color of the building (albeit admittedly an old, perhaps faded photo) looks more like the golden hue of the Bell Telephone Building but, again, I don’t see an exact match in pictures of that building either. I will keep looking! There were many flying saucer type buildings at the fair. Again, thanks for the awesome site. Ok, I found further proof that, as Bill mentions in the previous comment, you and your mother are standing in front of GM’s Futurama Building. You can see that exact, round, section of the building in this video: http://youtu.be/2VvQxgEgu6k?t=2m59s – so cool that you got to attend the fair! I was born in 1967, and for me the fair was simply this magical world that existed in a large, gold colored souvenir book (similar to this http://www.ebay.com/itm/RARE-New-Yorks-Worlds-Fair-Souvenir-Book-1964-Gold-Edition-Hard-Cover-/191066604628 ) that my parents had bought when they’d gone to the fair, in their happy-go-lucky days before they had kids. Does anyone know what happened to the original black stone marker of the burial-site of the 1939-41 Westinghouse time capsule? I gather it was stolen but haven’t been able to get chapter and verse on a report of the theft or a statement from the relevant authorities, let alone whether it was ever found. There are a few other remnants from the 1939 Fair to be seen – the boathouse and the bridge near what was The Town of Tomorrow…and the structure incorrectly labeled “1963 World’s Fair”, the little pedestrian structure, is partially composed of bits of the original Aquacade. I bet there is more to name. I know this is about the remnants of the 64-65 Fair still in New York. I don’t know if you aware of this but there is a remnant still proudly standing although not in New York. The Uniroyal (then US Royal) Giant Tire, which was commissioned by US Royal as a giant ferris wheel, had it’s gondolas removed and was moved to the Detroit area where it stands alongside I-94 near DTW Airport as a welcome to the Detroit area. It has been renovated & facelifted by Uniroyal several times over the years. If you want more information just Google “Uniroyal Giant Tire”. i live about a mile from it, the giant tire is s tanding tall today, and looking good~!! I visited the Fairgrounds yesterday and it brought back many memories of our family trip in 1964. The Unisphere and Queens Museum are gems; the panoramic map of NYC is a “must see” item. Does anyone know anything about the exhibit where they would have a volunteer (my father was one) who would hold a wooden paddle. They would then send electricity through the volunteer and burn the paddle. I’d love to know more about it. Anyone know? Thanks. I passed by bus, what looked like a park, turned out to be the Queens Botanical Garden. It was originally created for the 1939 World’s Fair. 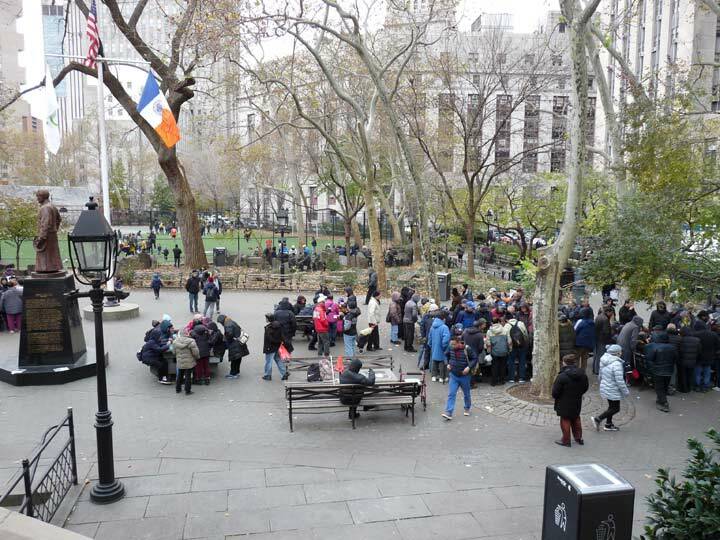 It’s still more of a park, than a botanical garden. 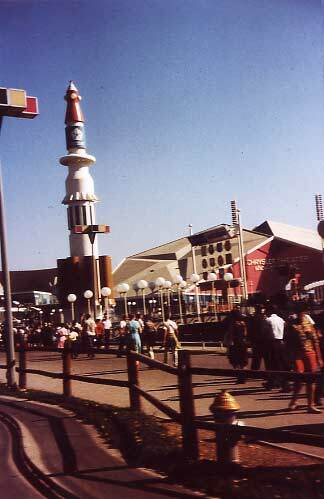 I visited the 64′-65′ N.Y. Worlds Fair three times during its run; my dad worked there as we lived nearby in Woodhaven. Although I was only nine and ten years old, and moved to FL the next year, I’m quite certain that the building behind you and your mom at the fountains is the General Motors pavilion. I can recall riding in the futuristic cars ( ‘ perhaps a ’67 Impala? – -LOL!) that traversed along on a belt. All my brothers and sister fought for who was going to sit in the drivers seat. With eight kids, I’m sure we took up two cars. Wow! Thanks for the memories! You have moved me with this beautiful website. Thank you! Terrace on the Park, a catering facility. I’m from Italy and I was just watching a re-run of CSI NY where in and one episode (series 6, I believe) they feature the Unisphere! It really caught my eye and curiosity, as having been to NY I had never read anything about it. Fantastic and fascinating stuff! Thank you for shedding some light about it. Dear webmaster…..I didn’t catch your name as of yet. Cool site and I’ll be back. But what I wanted to say was…..my brother and I traveled through La Guardia this fall on our way to Nova Scotia. And as we took off, I sneaked a peek past my brother (he had window seat) and was blown away by the view! 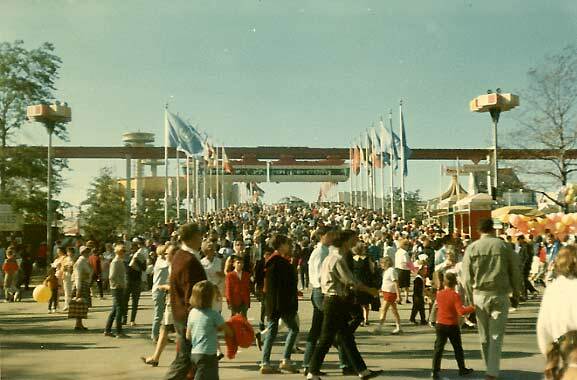 I was born in upstate NY and lived in California all my life but I was taken to the 1964 worlds fair by my parents, along with my older sister. I recognized immediately the world sculpture and a few other buildings or structures! I was so excited to see this from the plane. I have never been back to the site of the fair. But what a view and I had no idea the fair had any remains standing nor that La Guardia was so close to it. I said to my younger brother, “I was there-it’s the world’s fair!” And imagine that…..it was an unexpected highlight of my trip back east!